CENTRAL, S.C. – The Simmons Family Christian Endowed Scholarship has been established to assist Southern Wesleyan University students who hold memberships within the South Carolina District of The Wesleyan Church and are fulltime ministry and missions majors. 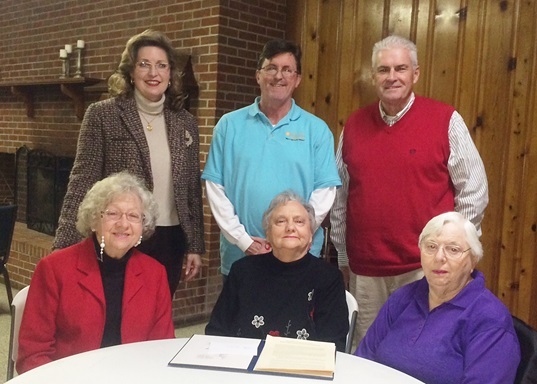 The $30,000 donated to fund the scholarship at Southern Wesleyan included funds that were transferred from the Simmons Family and Greenville First Wesleyan Church through the Wesleyan Investment Foundation and an additional gift from the Simmons sisters. Pictured in front from left are sisters Shelby Jean Simmons, Rachel Lavonia Simmons and Mary Jo Simmons, who established in their parents’ memory the Simmons Family Christian Endowed Scholarship to assist Southern Wesleyan University full-time ministerial studies or missions majors who hold membership in the South Carolina District of The Wesleyan Church. Standing behind them are Dr. Lisa McWherter, vice president for advancement; Rev. Joey Parris, representing Greenville First Wesleyan Church; and Rev. Buddy Rampey, superintendent of the South Carolina District of The Wesleyan Church. Shelby and Rachel are 1965 graduates. Mary Jo served as LEAP site administrator at SWU’s North Augusta learning center from 1997-1999. Expressing appreciation for the generosity of the Simmons family, Buddy Rampey, superintendent of the South Carolina District of The Wesleyan Church, said the scholarship will benefit ministerial students for generations to come. “It is no surprise that one of the challenges students face today in receiving a college education is cost. This is especially true of ministerial students, because we discourage the accumulation of significant debt given the typical income they can expect following their graduation,” Rampey said. “We are delighted with the scholarship for ministerial students from the South Carolina District attending Southern Wesleyan University that has been established by the Simmons Family. Joy Bryant, executive director of alumni and constituent relations, characterized the Simmons sisters as living examples how to put the fruits of the spirit into action. “Each of these ladies has these characteristics: love, joy, peace, longsuffering, kindness, goodness, faithfulness, gentleness, and self-control. I consider it an honor to know these ladies,” Bryant said. For details about the Simmons scholarship and other scholarships, contact Lisa McWherter, vice president for advancement, by calling (864) 644-5013 or email lmcwherter@swu.edu.